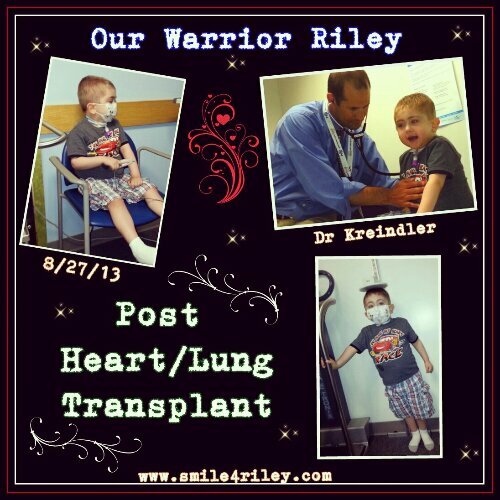 Riley had his visit with Pulmonary on Tuesday. In the Big Picture Riley is doing Good! For example .. Riley’s first five years of life he was barely on the growth chart .. He was just kinda holding a steady line across the bottom of the chart. Now .. his line goes Straight Up! Literally! So much so that we cut another 10% out of his daily feeds. Another good thing because it’s less time he spends hooked up to something! This may be a little TMI for some but to me it feels like a Yay so I wanted to share … ..It appears doing the Postural drainage has helped! (Chest PT where he lays down our legs.) Riley has been a little extra junky which is why we started doing that kind of chest PT. 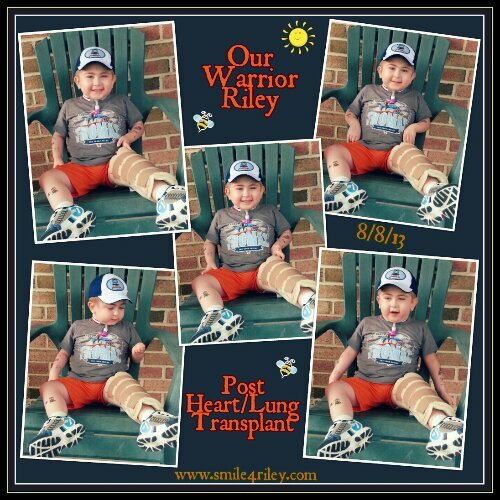 Mind you .. Riley has battled with sounding Rhonchi especially in his lower lobes since Transplant. Part of the problem being you lose the sensation to cough below the anastomosis. Flipping him pretty much upside down helped to work the secretions up. Unfortunately it came up like he was throwing up but it was All mucus! Lots of it too! So as Crazy as it may sound .. I wanted to do a Happy dance when Riley started spitting up all this mucus! He needs to work it out of his lungs so bad! With the Bronch/Cath/ENT procedures coming we need him as clear as possible if we want to Hope for Decannulation. To much secretions irritate the upper airway and if that is the case at the time he again won’t be ready for Decannulation ..
Riley is now wearing a knee immobilizer because it is believed he may have a hairline “toddler” fracture. On Monday while he was walking his left leg kinda gave out on him. With that he fell and banged his knee. Well once that happen Riley wouldn’t walk! He would attempt it but once it was time to put pressure on the left leg wouldn’t. He said it hurt. We already had an appointment scheduled at CHOP so we talked about it with the team. Riley wouldn’t even walk to get his Thomas stickers that he always goes and gets with Debbie (social worker). Riley was scheduled to see the Orthopedist in September because of the Coxa Valga but with one phone call we were in Ortho in 20 minutes. They did another xray of his tibia this time. The Orthopedist came in after and told us for starters that Riley doesn’t have Coxa Valga. That it was positional. He also said he didn’t see any fractures on the xray but with Riley he couldn’t rule out a hairline fracture. So he said to wear the immobilizer for 2 weeks till we see him again. If it’s not improved by then we may discuss a hard cast. He also said though that he can’t rule out Avascular Necrosis. Another condition that could be caused by steroids. Avascular Necrosis also known as osteonecrosis, aseptic necrosis or ischemic bone necrosis, avascular necrosis (AVN) occurs when the blood supply to bones is temporarily or permanently blocked. It affects between 10,000 and 20,000 people in the United States each year. Without an adequate blood supply, bone tissue dies, bones develop tiny cracks and, eventually, collapse. If a joint is affected, the joint may collapse. AVN usually occurs at the ends of long bones, such as the femur, the bone between the hip and the knee. It can, however, affect any bone including, most commonly, the upper arm bone, knees, shoulders and ankles. AVN can strike one bone, more than one bone at the same time or different bones at different times. When used for a long time, steroids which are used as anti-inflammatories can lead to non-traumatic avascular necrosis. Such long-term use of steroids appears to be related to about 35 percent of cases of non-traumatic AVN. Although the cause is unknown, it may be that steroid use decreases the body’s ability to break down fatty substances in blood vessels, which then block blood flow to bones. 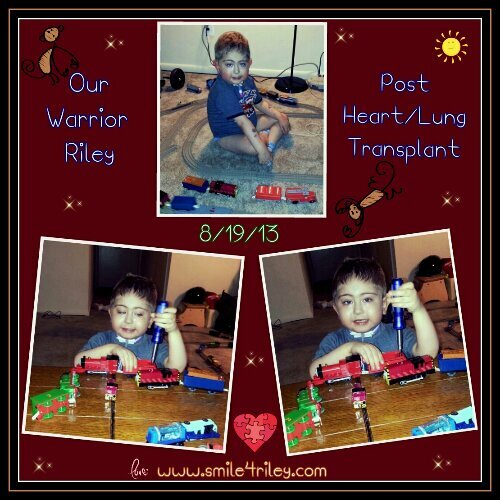 I spoke to a member of Riley’s team on Thursday regarding the results from his xray and ultrasound. It appears that Riley has Coxa Valga or Anteversion Deformity (bilaterally – right and left). This issue can be a result of bone disease, such as bone demineralization (from chronic steriod use, etc) or congenital (born with this). On our trip to CHOP on Wednesday we met a new friend! Samantha reached out to Team Smile4Riley through Twitter asking if she could write her feature story .. as she finishes her internship with the Ryan Seacrest Foundation .. on Riley and his Journey. Of course the answer was Yes!